American Express Centurion lounges seem to me to be so crowded no one goes there anymore. The lounges are nice, an improvement on their US airline lounge alternatives. They’re stylish spaces with decent food and beverage programs. And whenever you have a nice lounge demand for the lounge is greater than you expect, even knowing that the lounges are going to face heavy demand because people are going to want to use them. American Express has been building bigger lounges (the ones slated to come online in Denver, New York JFK, and Los Angeles are bigger than earlier lounges, though it’s hard to get space in airports and they frequently have to take what they can get) and they have been expanding lounges (such as Dallas Fort-Worth and Miami). But it’s not enough. Even the new larger Dallas Fort-Worth lounge can get crowded though it’s quite sublime during non-peak times. Apparently Centurion (Black Card) cardmembers can continue to use Centurion lounges on arrival. Back in September American Express said they’d introduce a reservations system for accessing their lounges, and then walked that back. I anticipate they’ll need to do something more than make this change permanent, because during peak times the changes announced today have not been sufficient to keep the lounges from being overrun. It does look like they’ve solved the real challenges of their on-again off-again approach, which gave travelers little notice and meant customers on long connections couldn’t use the lounge for their full connection. As I read this a customer on a long connection could use the lounge more than three hours prior to departure of their onward flight. Unfortunately gone is the ability to use the Centurion lounge showers on arrival after a long flight. Previously American Express tried to limit crowding by reducing the number of guests a cardmember could bring in and eliminating single visit passes for non-Platinum and Centurion cardmembers to use the lounge. They are walking that back slightly by exempting children under 2 from counting towards a Platinum member’s two guest allowance. So if I am reading this correctly. 1.) Customers facing flight delays can stay longer than 3 hours since access is based on original scheduled departure time. 2.) Customers with long connections will be granted admittance as the 3 hour restriction doesn’t apply to connections. Correct? If so I think this is a sensible policy. Correct – You can enter any time 3 hours from your scheduled departure time onward, you don’t have a limit of 3 hours in the lounge. I doubt it will solve anything. The issue is it has become the sweet spot for huge families traveling together. I don’t know how they are all getting in but I assume that the husband, wife, grandmother… all have a Platinum issued card off the main cardholder’s account which gets in the 6 kids (which is legitimate as each cardholder pays the annual fee). Now the babies and toddlers get added on free with the new rules and the whole thing is a disaster. The Dallas lounge is like a day care center with a buffet that becomes a feeding frenzy of kids. With the Admirals Club closed in the D Terminal it’s become even worse. Impossible to find seats at anytime I have been there and kids running wild all over the place. I can’t even imagine what it’s like in summer. I actually find a quiet corner of the D Terminal with an unused gate to be a more pleasant experience. In the first sentence, you don’t need to say “to me.” We assume that since you’re the author. It doesn’t make sense to me that they added showers to the new DFW lounge if they’re going to prohibit entry on arrival. Does anyone shower before their flight? @Veejay. On the contrary. They have every right to use it if they pay the fees and abide by the entry rules. My point is that it has become a sweet spot for a family with kids and if you look at the Centurion Chuck E’ Cheese Lounges these days you will see that in many ways it is a direct result of the overcrowding and poor atmosphere as these parents do let them run wild all over. Which, well, they are kids….so be it. My point IS that I choose to avoid this and would rather find a quiet gate at the D Terminal at DFW until the Admirals Club reopens. On a side note..check out the “family room” in the Dallas lounge. I always laugh as I have never seen any kids in there as I assume a family prefers the open areas. I have though contemplated sitting in there myself as it’s usually the only empty spot with a seat! So when my kid turns 2 do I need to make sure my wife gets a card too? How much more is that? My plat card will be canceled once my next annual fee comes due. The 3 hour rule is too strict for places like La Guardia. For instance I travel Delta (Terminal D), and the Centurion Lounge is in Terminal B. And there is LOTS of construction at LGA which means extra travel time between terminals (bus). If I want to go to the Centurion Lounge before my flight to enjoy a snack, 3 hours does not leave a whole lot of time to get over to Delta Terminal D and then through security, and on to my fight which starts boarding 40 minutes prior to departure. NOT GOOD. Visited DFW in the morning a few weeks ago. Couldn’t get out fast enough to sit in the “quiet” terminal. Only 2 stalls in the tiny men’s room continually had a line, and waiting in a line in a men’s room is anything but luxurious. Crowded line to struggle for a coffee or some breakfast. Few seats open and, yes, kids. What is the point? I was in the SFO Amex Lounge yesterday in Terminal 3. The 3 hour limit is really 1.5 to 2 hours, since I will flying out of Terminal 2 on Alaska Air, because Alaska boards about 30 minutes before departure time and it takes a minimum of 30 minutes to go back through security in Terminal 2. I actually had a 2.5 hour connection. By the time I made it from Terminal 2 to Terminal 3, it took me about 30 minutes to walk to and get through security in Terminal 3 (read one hour in lounge). I needed food, so I was planning to eat at the Yankee Pier using Priority Pass instead of using the Amex Lounge. However, there was a line at Yankee Pier (looked like 15 to 20 minutes). So I went to the Amex Lounge. There were no seat anywhere. The staff (which is great) found me one. There was a line for food and chicken was out. Had to go back for chicken. Wine as always was excellent. Left myself 30 minutes to get back to Terminal 2. Luckily, no line at Terminal 2 security, so just made it. 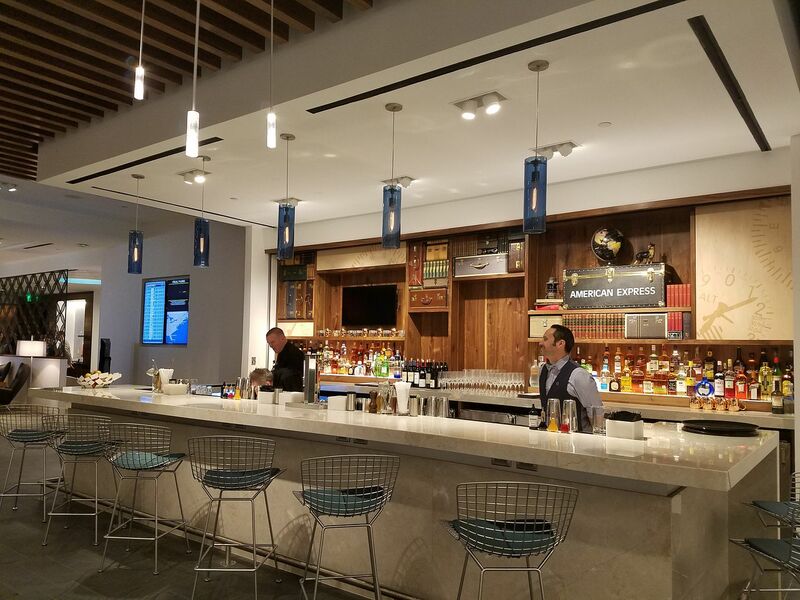 For Platinum members, Amex Lounges combined with Priority Pass is a great. It just worries me that how crowded the venues are becoming. Slightly Off-Topic: I was in the Las Vegas Centurion club on Sunday and all of the food was incredibly bland. No flavor or taste at all, other than the Orange Juice. Has anyone encountered this at the Centurion lounges? The food was never like this before. @Gary: There is no intractable problem. The overcrowding is invented by AMEX. They are the only issuers of access rights. You appear to be oblivious that AMEX has just continued down the path of degrading the AMEX product. AMEX is flooding the market with so many of these cards for the massive $550 fees knowing that they have no room left in the lounges. That’s the policy. It is what “membership” means. It actually amounts to bordering on fraud. You are too tied to your advertising revenues Gary and have become the uncritical rent boy of American Express. L3, I think you are being disingenuous when you say the Platinum cards have “massive $550 fees” when you get $200 of Uber credit, a $200 travel credit, and a $100 credit at Neiman Marcus. On top of that you get gold status with Marriott and Hilton’s loyalty programs and elite status with a number of car rental firms. If the card only gave lounge access and cost $550 the lounges I would pretty much guarantee be empty. @L3 – “uncritical rent boy of American Express” wow, I think I’ve been highly critical of the lounges describing them as ‘so busy nobody goes there anymore’ but maybe you and I are reading a different post/site. Looks like I was ripped off again. I didn’t get that — and it didn’t exist as of yesterday. Look at AMEX’s income statement. If they sell one more card the income statement goes up by$550. The cost of lounge benefits is not altered. The burden is placed on poor Gary who is already a member and is turned away at the door. AMEX blames overcrowding and there are some people stupid enough to believe that. Anyone who listened in ECON 101 knows that there is a supply curve as well as a demand curve here and one party and one party only controls the both of them — AMEX. They sell the card (demand) and operate the lounge (supply). There is no accident when Gary is cruelly thrown out on the street at the tender age of 56. AMEX designed it like that. Membership has its privileges — and sometimes not. I am 100% with @Stuart and @Chas. Stewart is correct based on my observations in DFW. Very large family groups, many I noticed, seeming to be from overseas. Does AMEX have relaxed rules on the cards they sell outside the US versus domestic cards? As pointed out by others, the problem is entirely that AMEX has a fixed resource that they are selling over and over and over again. The whole thing is reminiscent of The Producers. It works fine if the lounges are lousy and no one uses them, but the minute they become a hit they’re doomed. The solution is for AMEX to stop selling lounge admissions by removing this perk from new sign-ups and possibly renewals (or, if that’s not possible, just suspend new Platinum cards), until they can increase capacity to handle the additional sales. Then, only offer new cards up to the number of lounge users they can support. Most airline bloggers are too stupid or ignorant of Economics to understand it (they think the overcrowding is caused by the crowd fairy). If you understand that it is a closed system, manufactured crowding, and if you do represent travellers, then this should be your cause celebre for 2019. It is a giant rip off. If any Platinum Card executives are reading this, I think Amex is pushing it too much. I would rather go back to a basic Platinum card WITHOUT the $200 airline credit, WITHOUT the $200 Uber credit, and without the $100 Saks credit, and bring the card annual fee down to say $150 or $200. Amex keeps raising the price of the card and offering “goodies” I can’t use or is of no value to me (but charges me for). The Centurion Lounge is nice, but the new 3 hour rule is a NEGATIVE in deciding whether to renew my card. If one’s flight is leaving from a different terminal than the one the Lounge is in, 3 hours is NOT ENOUGH time considering having to change terminals, go through security, and be ready to board 30-50 minutes prior to departure time. Amex, you had better rethink this 3 hour rule, as well as price creep and adding “value” by adding stuff I don’t use or want. I’m on the verge of quitting you, and I bet I’m not alone. Same boat at @DON I rarely use this benefit but when I do I want/need to be with my wife and kid and it’s often times more than 3 hours. Someone could be using the club 50x a year or 3x a year but you penalize them both. Gotta reconsider the card now. I wish AMEX would raise the Platinum annual fee to $1000/year and increase the lounges’ number, size, and amenities to balance out the demand. This would thin out both the whiners and abusers. Perhaps the next recession will suffice. This new policy brings about the first time for which I am seriously thinking about closing my Platinum card account upon the annual fee becoming due. My preference for using the Centurion lounges is on arrival. For example, at LGA , I usually prefer to depart on one of the first flights out at around 6:00 a.m. The lounge (which is outside of security) is not open early enough for me to use it when flying out. However, when I arrive in the evening, I like having dinner and drinks at the lounge before heading back into the city. I am guessing this is only temporary restrictions. They will decrease the number of cardholders by making policy changes such as this and make it more difficult to obtain the card in the future. I use this Lounge to take a shower after a long flight before meeting business clients. That is why the DFW Lounge has three showers. I have seen 4 soldiers go down to the USO and bring a total of 12 people walking in the door with their free military Platinum cards. I have also seen large family groups capitalize on the $150 authorized user cards. Most of the time I’m a solo Traveler and use the showers upon arrival. Why the heck am I being punished when I don’t even have a guest with me! I will not be renewing my card and Amex can take 550 dollars off their earnings this year. BTW, the food quality has gone way down and every chicken dish only uses Chicken thighs and they’re pretty poor quality at that. Goodbye Amex you’re “good idea fairy” just cost you a customer. @Bill Smith, I too have noticed the food going downhill. Additionally, since they’ve started the lounges, I’ve only used the LGA Lounge three times (solo traveler) and the Seattle Lounge once (again solo). A total of 4 Lounge usages over 2 years. I AM NOT THEIR PROBLEM, but it feels like I AM BEING PUNISHED. And as I’ve said above, 3 HOURS AT LGA is not enough with having to switch terminals, go through security, and then arrive 40-50 minutes before boarding for their on-time (actually 5 minute early gate closure). Here’s an idea Amex, if you are reading this. If a person is a solo traveler – allow him/her 6 hours prior to departure AND admission after a flight. If a person is bringing in guests on their card, GIVE THOSE PEOPLE THE 3 HOUR RULE and NO ADMISSION AFTER A FLIGHT. People bringing guests and families are the ones clogging the place up. These changes might keep me a member at renewal time.